Vada's Blog Stamp Inks and Paper : Lace Valentine Box With Candy. Hershey’s Kisses with Caramel and Dove Deep Dark Chocolate promises? Lovely lace hearts cuts create this little box, all four sides were cut using the same Spellbinders D-Lites Die, (Medallion Four). 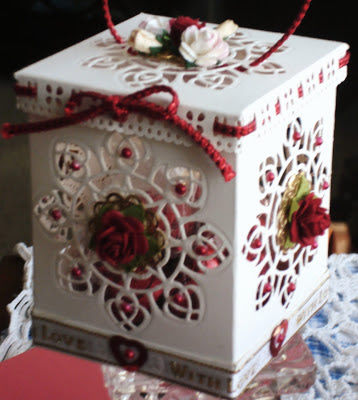 I used a Martha Steward punch for the box top (Embroidered Floral). 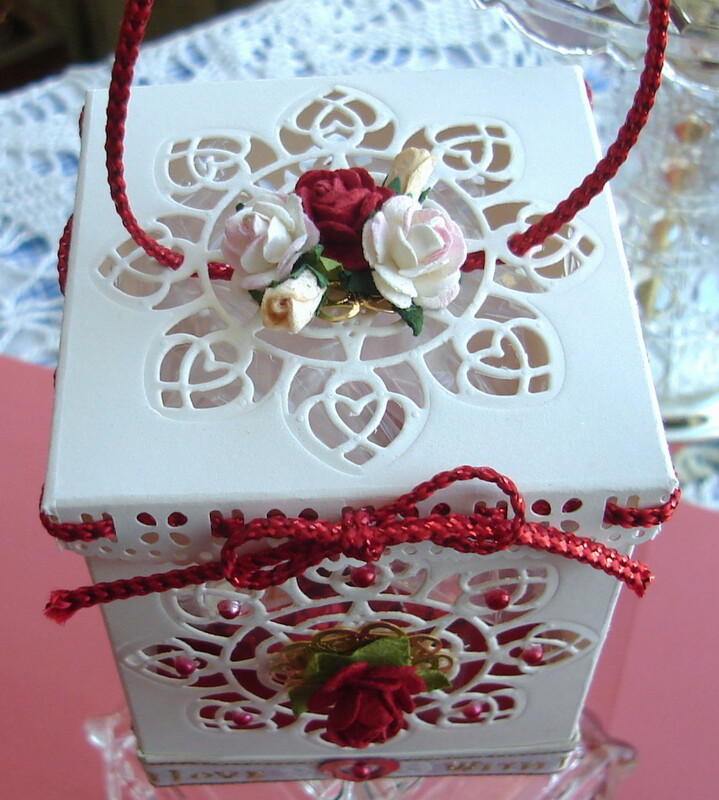 Added Red Pearls from Kaiser Craft, and Needloft plastic canvas yarn was threaded through the top of the box. Five (25 mm) Gold Filigree Rounds from Bits and Pieces were added, plus paper roses, red heart sequins and (With Love) ribbon. 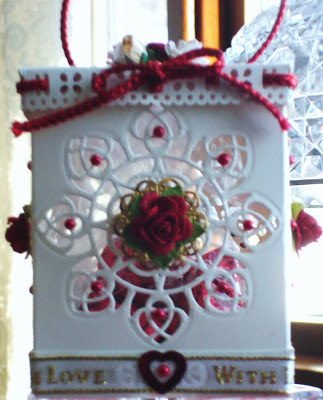 The box measures 2 5/8 x 3 ¼ . Now that it’s done (for now), I’m wondering if legs for this box would work, or would it look to (Bird Cagey) ? But then this opens another door, can’t you see two white Love Birds on a branch? 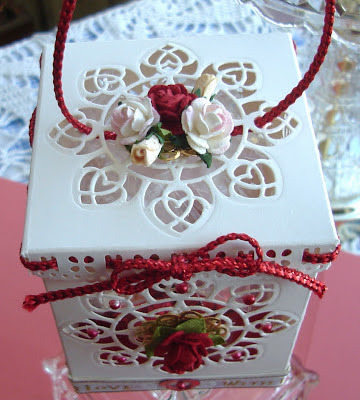 Ring bearer box? Don’t stop here as there’s Easter. WOW! 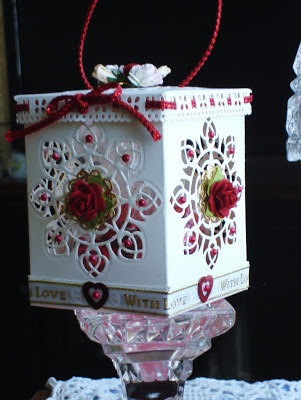 This is sensational, I cannot believe it has been handmade, all those intricate details, I am in love and if that were not enough, it houses candy, it doesn't get any better than that. Wishing you for 2013 health and happiness and please, continue sharing your delights with all of us. Vada, I am thinking you need to make another one going with that bird cage theme! Holy Cow, this is so romantic and gorgeous! 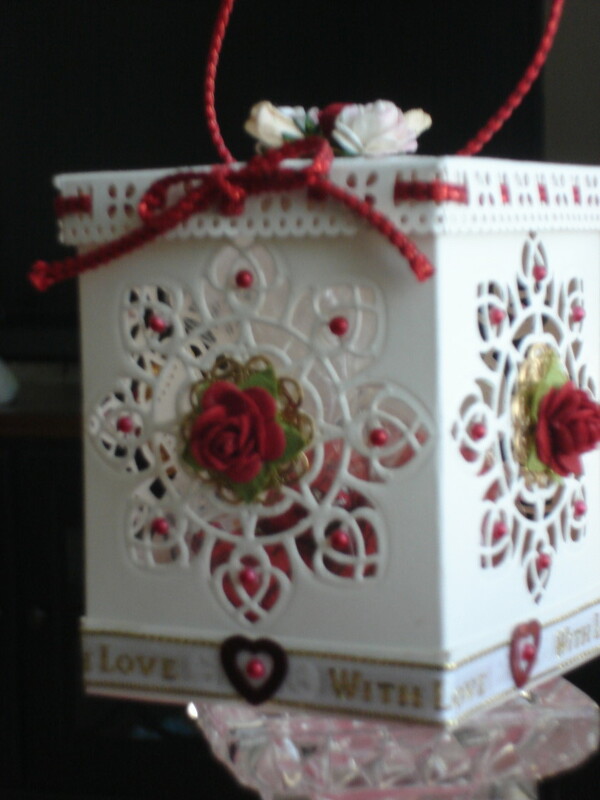 There is no crafter I know who can use Spellbinders and punches the way you do! I think legs would look really nice and not bird cagey if you went with the Valentine colors! You are amazing, GF! Thank you for the thank you cards! Love them and again, so beautiful! Happy NYE and may 2013 be the best year ever for you! Hugs and Love! Oh my gosh that's exquisite! It's a double wowzer!! Happy New Year Ms. V.!